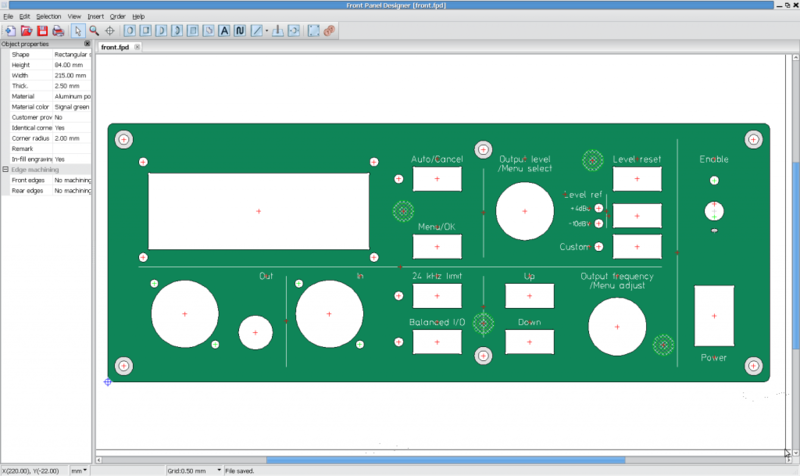 The first sketch of the front panel already gave a good idea of what I had thought the analyzer should do. The box will get an IP address, so some menus are for sure necessary to at least read the status and perhaps configure the Ethernet link. One button for that. Most of the controls will be for the signal generator, as it will be hugely convenient to be able to dial in a specific setting and then debug the device receiving the signal. The analyzer is synchronized with the generator and is therefore quite automatic. The signal generator’s output is most likely going to be just a sine wave, so level and a frequency controls are in order, and sufficient. A frequency dial alone can be inconvenient for scrolling a long way, so two buttons next to it for going up and down whole octaves at a time will make it more accessible. The signal generator’s output level setting should be straight-forward: decibels relative to some reference level. It just happens that there are a few different ways to define the reference level. There are at least two different yet common scales used for defining signal levels, the dBu standard and the dBV standard. dBu is used in “professional” gear, where signal levels are overall hotter to make use of the extra dynamic range afforded by it, and also because such devices have higher voltage power rails and therefore more headroom to work with. 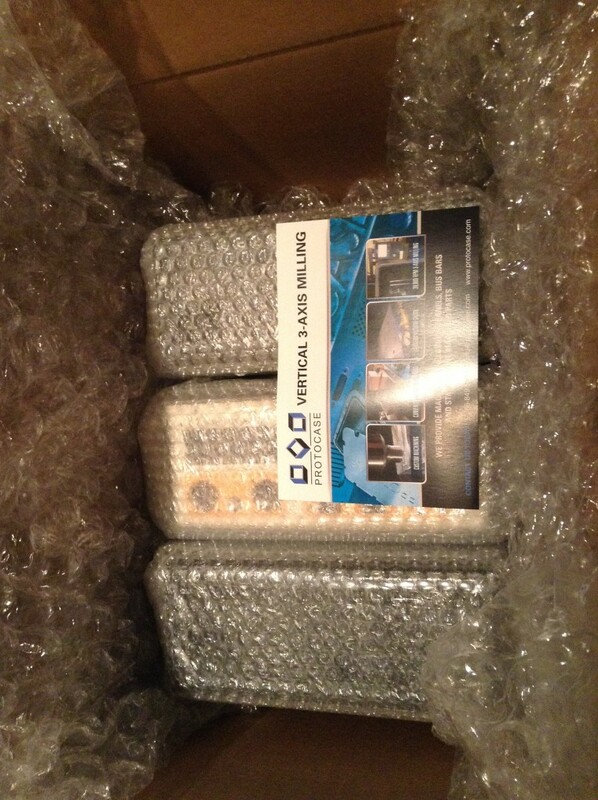 dBV on the other hand is used for cheaper devices that may even be battery-powered. The whole business of such reference level smells a bit old-fashioned, but since these are still commonly used, it should be possible to switch between them. I also found a handy web tool for converting signel levels from one scale to another. It could also be very handy to be able to set a different custom level as the reference and measure everything relative to that; even better if you could use the current input level as measured by the analyzer as the reference, and it should only take a single button press to do it. Some way to quickly skip through common preset levels is also needed, for the same reasons as the frequency control needs buttons, and that gives the third button for the level controls. At this point I still had an empty spot on the panel, and could only think of spending the space for two less critical switches: a balanced/unbalanced I/O button and a bandwidth limit control. 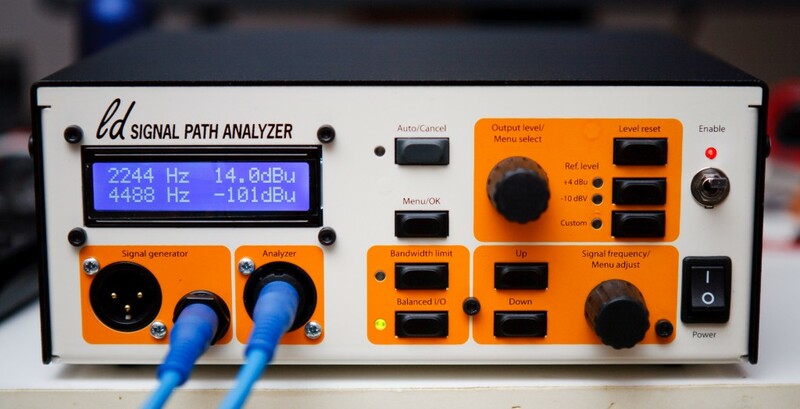 The idea with the bandwidth limit switch was to force the analyzer to use the lower 48 kHz sampling rate, with higher dynamic range and improved THD. To measure the distortion of >5 kHz signals it would still be necessary to enable the 96 kHz or 192 kHz sampling rates, but it could be useful to disable such automatic reconfigurations. The balanced/unbalanced switch takes care of the level adjustments needed with the two different interconnects: simply grounding or muting one side of a balanced cable would reduce the signal level by half, causing a significant measurement error! This can be automatically compensated for by switching the analyzer to unbalanced mode. At this stage I was sure enough of the practicality of the project, that I designed the PCBs and ordered and built them. I will write more about those in later posts. After verifying the general concept in hardware, it was time to decide on the final design. Again I went for Protocase to manufacture the enclosure, just because of the simplicity of their own cad design tool and the handy templates. With a little bit of good advice from Sebastian (check out his site for some really cool art!) I hacked together a more realistic design. The most important tip I got from Sebastian was: keep it simple. Even very simplified designs look awesome when they’re made into tangible objects. Typography should be simple but elegant (heh, maybe that’s still not my cup of tea) and emphasis should be on legibility and usability. So I kept it minimal. Colors are hard; somehow I have no intuition of which colors or tones work well together, but I knew the LCD screen would be blue, and inverse colors often work well together. But should it be orange, or should it be yellow, light or dark, saturated or not… choices, choices! This is also where the projects gets expensive – it’s much cheaper to make your own boxes out of wood or plexiglas, but these enclosures are really high quality and have a seriously professional feel! Even better, they’re very low-effort if your wallet can take the hit. That is definitely not the end of the process, but since you read it all the way here, have a treat. I really like it how the whole design turned out! I think I spent weeks just selecting the right components for the front panel. Connectors were easy, I’m used to Neutrik jacks. Likewise the LCD display is a common part, it pays off to keep a good supply of those, and the prices are very acceptable when buying in bulk. I must have pored over tens of shops just looking for knobs. It was so difficult to find good ones that we even considered making our own molds with Stijn. I don’t think I’m quite ready for that yet, but it would definitely be an option for larger production runs. Those that I used on the Protosynth I found first at Conrad, and later in different sizes at Das Musikding. The bigger sizes felt just right for this project. I covered them thoroughly with Plasti Dip, also to improve the plasticy feel of the plain knobs. The rubber paint gives them a very nice grip. The encoders are not both the same; I envisioned that the level knob would also be used to make a selection in the menus, so it should have a good stepped feel. After trying a bunch of different ones, I decided to go for Alps. The frequency dial is a smooth encoder from TT Electronics, and it requires medium force to turn, so that precise frequency adjustment is easy. The buttons are Marquardt 6450-series from Mouser. I think Clavia also uses them in their synthesizers. The leds next to them are just 0603 SMD leds placed directly on the PCB behind the front panel, but I found out that Toby has a good selection of light pipes in practical sizes, and got a bunch of those. The light pipes carry the light so that it looks like the light is emitted from them, and they are also flush with the panel. This way the front panel PCB can be inserted in place very quickly without having to worry about the placement or spacers of the LEDs. The light pipes are short enough to stay in place by just pushing them through the panel. On the back of the enclosure there’s just an Ethernet jack, USB jack (I still don’t know what to use it for – USB audio? In mono? Not very useful…) and a power jack. I also added a MIDI jack but it’s also an option for later use. 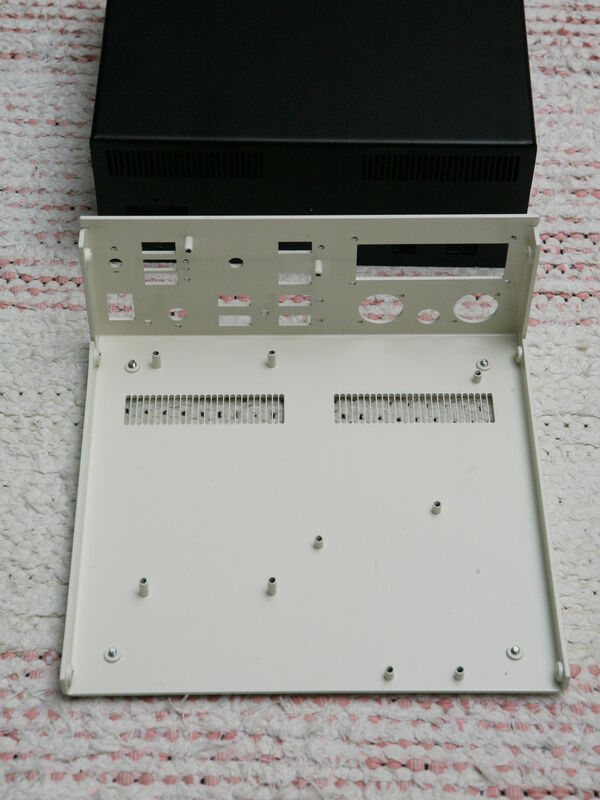 The insides of the enclosure are spiked with standoffs for attaching the PCBs. Sadly here Protocase made a small mistake and left out two standoffs on the front panel. I had to replace them with screws and spacers. Pity for the screws are now visible on the outside… I also still have to find some black self tapping screws for the XLR connectors. The rubber feet keep the box steady on the desk when buttons are pressed, and even when the small but sturdy power switch is operated. The box is made of just two parts, the base and the cover, and the base is very thick and heavy; it’s 2.3 mm thick steel! The box is too heavy to lug around, but it feels very robust and reliable, which is definitely a plus. This entry was posted on November 26, 2014. It was filed under Audio analyzer. Oh, that looks like a really nice board too. Thanks for the link! +1 for those buttons – they are really nice!